Watching foreign-language movies can be a great asset to the language learner. Not only do they contain an enormous amount of dialogue produced by native speakers, but they also introduce the viewer to several new slang expressions, and shed insight on the culture which the movie belongs to. And with an increasing number of shows and movies appearing online on YouTube and Netflix, it’s easier than ever to access new media. Still, if you’re just passively watching films in a different language, you’re not fully taking advantage of the amazing resource that these movies offer you. Indeed, with a little concerted effort, you can transform your television (or computer) into one of the most valuable language-learning tools out there. Here’s how. Language is an inherently social activity, and it’s one that’s best done with friends. 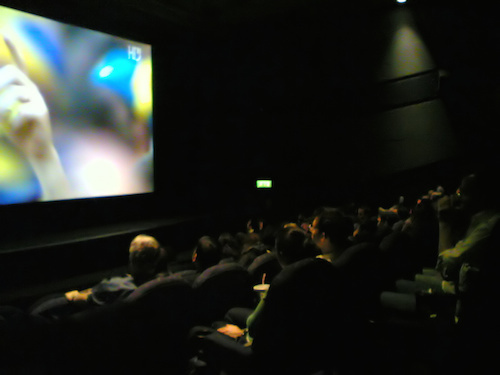 Luckily, there are thousands of like-minded language learners out there who would be more than happy to watch and discuss a movie with you. So sign up for a language exchange website like Gamelingu and find a conversation partner! This can be a native speaker in the language you’re learning, or even a non-native speaker who’s learning it too – anyone who you’ll be able to discuss it with later. Once you’ve found a buddy, it’s time to select a film that you both want to watch in your language of study. Make sure it’s something you’re genuinely interested in, as you’ll be watching it more than once! When you’ve selected a movie, it’s time to get cracking. The first time around, just watch the movie in peace – later, we’ll start working harder. This will give you a general idea of what’s going on with the movie, and will acquaint you with the characters and their manners of speaking. If you can find a version with subtitles (in the target language), it would be ideal, so if you get lost in the dialogue, you can still follow along. You’ve finished the movie – congratulations! Now, the real work begins. First, go to the Internet Movie Script Database (http://www.imsdb.com/) and download the movie’s script (if it’s not on IMSDB, try Googling it; many scripts are available for free online). As you go through the script, highlight the parts that you don’t understand, and study them. Check out dictionaries or online forums when necessary, and of course feel free to consult with your conversation partner if a word or phrase really has you stuck. If the script isn’t available online, watch the film again with subtitles, and write down the parts that you don’t understand. The important part is that you write down unfamiliar words and expressions and study them until you’re able to understand all of the dialogue in the movie. You’ve finished the real hard work – pat yourself on the back! Depending on your level, at this point you may done quite extensive research about all the new words and phrases that you encountered in the movie. Now, it’s time to say goodbye to your training wheels: no more subtitiles! By now, you have a good sense of the plot and the dialogue, and you’ll be surprised by how well you understand the script even without the aid of subtitles. Feel free to consult your notes if you miss something, but make an effort to rely on them as little as possible: focus on understanding the dialogue by yourself. Feel free to watch the movie as many times as you’d like, until you’ve really learned everything (or until you get bored)! You’re done – congratulations! Here comes the fun part: find your friend and chat about what you just watched. This will give you a chance not only to have an interesting discussion about the movie, but also to use some of the new words and phrases that you’ve learned along the way. After you’ve had a lively discussion, it’s time to pick another foreign-language movie! You’ll be surprised at how many new words and phrases you can learn from studying just a single movie. If you follow these steps, you’ll notice a marked increase in your language skills after just a few films. Readers: What are your favorite foreign-language movies? What do you do to remember the dialogue you hear in films? Let us know – leave a comment! Paul writes on behalf of Language Trainers, a language tutoring service offering personalized course packages to individuals and groups. Check out their free language listening tests and other resources on their website. Visit their Facebook page or contact paul@languagetrainers.com with any questions. How I impressed a French girl with the help of a Gamelingu native speaker!